It is the "Floataround" round pools favoured by Dr Justin Feinstein* of LIBR with their self centring shape giving that open ocean feeling that are becoming the most popular for new float centers. This collaboration is ground breaking and will pull the whole float industry into the mainstream where it belongs. The round float pool of 2.4 metres (8 feet) in diameter is the same. The round pool is 280mm (11 inches) deep and big enough to stretch the arms and legs, so it is ideal for gentle floating exercise as well as really relaxing. The high ceiling and open design prevents any thoughts of claustrophobia, ideal for first time floaters. When built the Floataround is our largest standard product, but the base and ceiling come in quadrants that are assembled on site, making it the most flexible product for installing into difficult access buildings. Couple Floating - Why a pool so large? Floataway pioneered the concept of couple floating by offering the Floataround and Cabin ForTwo designs. They allow two people to comfortably float together, or one person the ultimate self centring float experience. Commercially it has proved very important and very popular. Floatarounds obviously need a larger room than Floataway's other float tanks and Cabins. So this product is aimed at commercial spas where its imposing design can be appreciated. Various lighting effects can also be employed to highlight its exterior appearance. The curved walls and glowing wall panels create an experience as you enter the room. The room lights can be controlled by the user to give total darkness once the session starts. The Floataround also has the very popular option of a hand crafted star effect ceiling. The pool is also popular by itself with a technical pack and custom built room around. 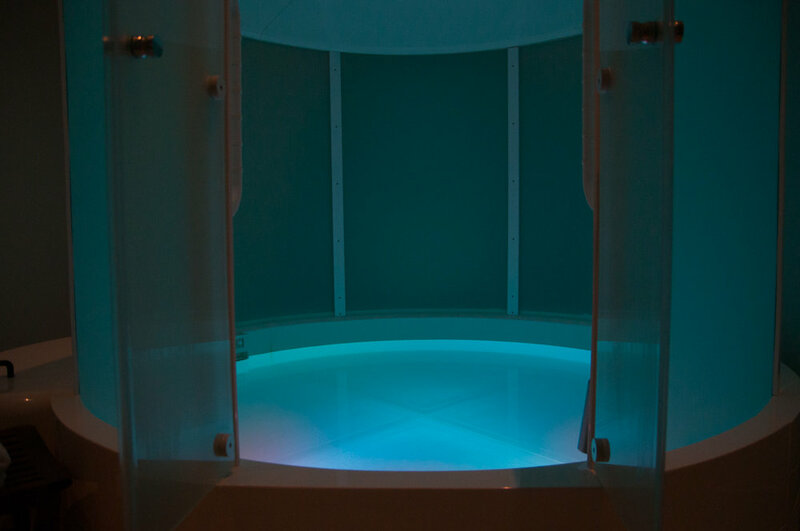 It is these open "Floataround" round pools favoured by Dr Justin Feinstein of LIBR with their self centring shape, giving that open ocean feeling that are attracting so much media attention and being favoured for clinical use. The pool can be built with the door section (as seen above) so you can upgrade to a full Floataround if you choose at a later date. Unlike the Tranquility that has all the technical equipment hidden within the side panels, the Floataround (like our cabins) require a technical pack. The Floataround technical pack is curved to complement the product. The position of this can be chosen to best suit your room. The high power and efficient pumping system is compact and quiet and the reinforced cover can be used as a bench in the float room, or fitted in adjacent room. *Dr. Feinstein has no financial interest or investment in Floataway. In addition, Floataway is not directly involved in any of the research being conducted at LIBR and has no role in the study design, study funding, data collection, data analysis, or reporting of results.